Pope Francis vowed on Saturday to end the sexual exploitation of children by clergy during a highly-charged visit to once deeply Catholic Ireland and, according to victims, said the corruption and cover up of abuse amounted to human excrement. On the first papal visit to the country in almost four decades, Francis used a speech at a state event that was also attended by some abuse survivors to acknowledge that it was to the Church's shame it had not addressed these "repugnant crimes" and said he sought a greater commitment to eliminating this "scourge." In a statement, the representatives from the Survivors of Mother and Baby Homes group said Francis condemned corruption and cover up within the Church as "caca," an Italian and Spanish word for human excrement. The statement said that after the pope used the word, his translator explained that it meant "literally filth as one sees in a toilet." "Very powerful meeting. He listened with a genuine interest," said Clodagh Malone, who was born in one of the state-backed homes for unwed mothers and adopted at 10-weeks-old. The pope earlier spoke publicly about abuse, saying he could not "fail to acknowledge the grave scandal caused in Ireland by the abuse of young people by members of the Church charged with responsibility for their protection and education." "The failure of ecclesiastical authorities - bishops, religious superiors, priests and others - adequately to address these repugnant crimes has rightly given rise to outrage and remains a source of pain and shame for the Catholic community." In unprepared remarks, Francis added a reference to a letter he addressed last Monday to all the world's Catholics on the abuse crisis, saying he wanted it to signal "a greater commitment to eliminating this scourge in the Church, at any cost." More than three-quarters of Ireland's population flocked to see Pope John Paul II in 1979 when divorce and contraception were illegal. Francis was greeted by far smaller numbers. Large images of abuse victims and the hashtag #Stand4Truth - promoting a gathering of survivors and supporters elsewhere in Dublin when the pope says mass on Sunday - were projected onto some of the capital's most recognized buildings on Friday night. They included Dublin's Pro Cathedral, where on Saturday Francis prayed before a candle commemorating abuse victims that was first lit in 2011. However, flag-waving supporters still gathered five or six deep along many parts of Francis's route by popemobile, although in other parts he was greeted by a more sparse turnout. "I think it's absolutely marvelous. There are one or two objectors, but I think they should keep their objections to themselves and get into the spirit of the thing," said Christina O'Riordan, a 76-year-old retired teacher. Despite changes in Irish society, Francis asked that Ireland would not forget "the powerful strains of the Christian message" that have sustained it in the past, and can continue to do so in the future. "The crowd is smaller than I thought. It's a good crowd, but wouldn't be near what you'd get for (Saint) Patrick's Day," said Christy Moore, 59, referring to Ireland's national holiday as he sold papal flags wearing an 'I love Pope Francis' hat. "It was much much bigger (in 1979). There's not that much interest in it now." Prime Minister Leo Varadkar, who last year became Ireland's first gay leader, told Francis that the wounds of clerical child abuse that stained the Irish state were still open and there was much to be done to bring about justice and healing for victims. "Holy Father, I ask that you use your office and influence to ensure this is done here in Ireland and across the world," Varadkar said. "We must now ensure that from words flow actions." In other protests, gay rights activists hung rainbow umbrellas from a nearby bridge while a silent vigil will be held on Sunday at the site of a former "Mother and Baby Home" where an unmarked grave with the remains of hundreds of babies was found in 2014. 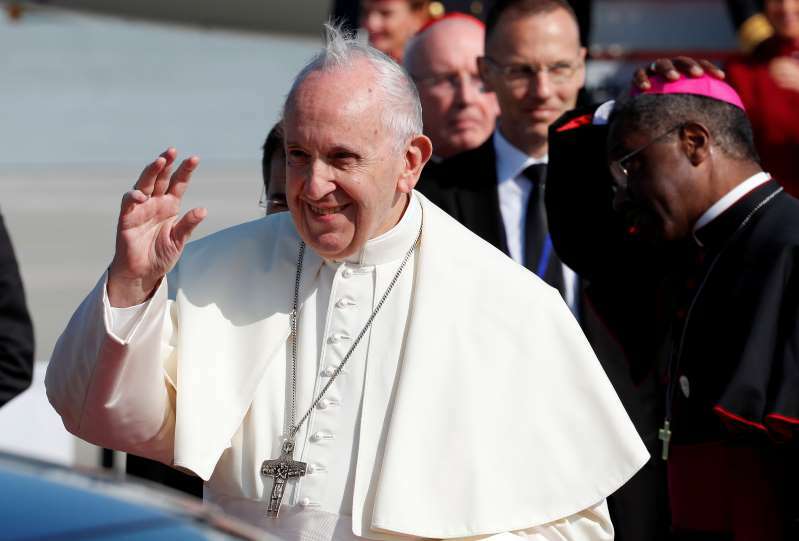 The pope, who traveled through Dublin in a blue Skoda in keeping with his shunning of limousines and bulletproof cars, said Church leaders needed to remedy past mistakes and adopt stringent norms to ensure they do not happen again.